FFF LOVES… Clare’s colour coordinated dress and cocktail ensemble. Jarslberg cheese, a lovely creamy brie, parmesan, maybe a chunk of something blue - we are cheese fiends in our house, but does it count if it’s in the fridge? In the pantry, it’s penne pasta, anchovies, olives, capers, San Pellegrino mineral water – I down bottles of the stuff every day. 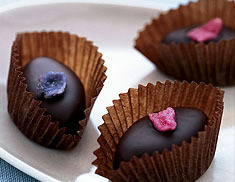 Charbonnel et Walker violet and rose creams – nothing beats eating chocolates in bed. Billecart-Salmon champagne and Sea Salt Kettle Chips. I seem to buy a melon every week just to throw it away. Mrs. Press is the perfectly polished womenswear label designed by Australian Vogue’s former features director, Clare Press. The label is stocked by prestigious boutiques throughout Australia and regularly makes a splash in all the glossy mags. Clare’s impeccably made silk dresses and layering pieces are just the ticket –whether you’re lolling about in your place, flitting across the seas or gadding about town. The SS09/10 collection features a fresh palette of cream, white, navy, Wedgewood blues and soft greys with scarlet accents. The label’s all-natural fabrics include 100% silk jersey, sand-washed silk satin and crepe de chine, as well as light as air silk/cottons. Mrs. Press’s exclusive prints, all produced in Australia, are the work of our artist friend Bethany Linz.